For convenience of access, we have posted all the Consciousness & Economics essays below. To some, consciousness may seem like an abstract subject of study, devoid of practical consequence for what most people value in their day-to-day lives. For instance, what does the possibility suggested by near-death experiences that reality could extend beyond the material realm have to do with the Gross Domestic Product? To Steiner, interdependence is at the root of most spiritual traditions, and increasingly serves as the foundation of scientific inquiry, including systems theory and quantum mechanics. 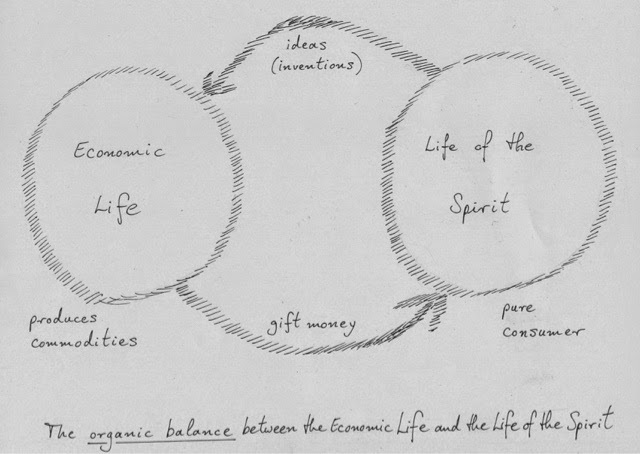 In the sphere of economics, Rudolf Steiner described it as “associative.” He understood money to be a bridge – a circulatory system – invented to connect human beings in relationships of service. The Tao of the Dow: Consciousness & Economics III "We need a powerful new story"
The paradigm shift afforded by lucid projections of the consciousness or out-of-body experiences is just as impactful. It is similar in the way that we see our "home" from the outside and have the chance to reconsider it. It also broadens our sense of universalism and triggers serious questioning of reality and our place in it. Both experiences bridge theory and visceral experience, as beautifully described in the film The Overview Effect. In other words, unlike the outdated view of the OBE as a dissociative experience, it is quite the opposite. Both the "out of body" and "out of planet" experiences are profoundly integrative, expanding our sense of oneness with fellow beings, with the very fabric of multidimensional Reality. We see signs that people are starting to realize the potential of conscious economic collaboration with the sharing economy, democratic or cooperative companies, and the world of collaborative social apps. For the majority of human history, we have considered the human spirit, soul, self, or mind a self-evident and fundamental part of Reality. The material realm was often regarded as less of a reality than consciousness, or at best an extension or reflection of it. With the progress of empirical science, however, a conflict developed between those those who dared question orthodox doctrines and the religious power that defended such dogma. A relative truce was achieved by establishing mutually-exclusive magisteria: the material realm could be investigated by the scientific spirit and matters of the spirit were to be left to the clergy. Alan Watts on "What's wrong with our culture"